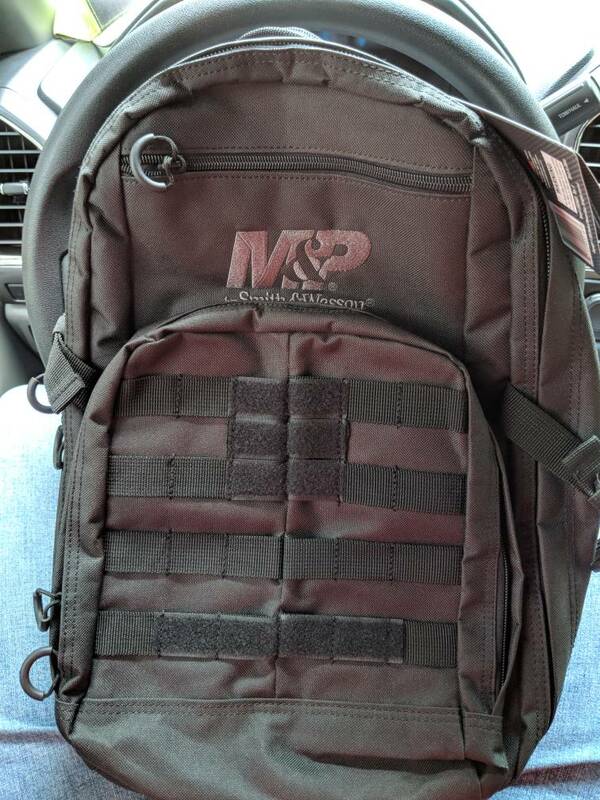 Smith & Wesson M&P backpack for school? I picked up my nephew this morning to do some school shopping and we end up at academy looking for backpacks. He initially wants an Under Armour but we venture over to the hunting/shooting area and he finds the pack pictured below. I say sure and buy it. After walking out I started wondering if he'll have issues wearing it to school because of the maker. My wife says she wouldn't have bought it. If he was my kid I would let him wear it and deal with any blowback myself but he's not mine. He's 11...I think....so he's getting to the age where the school might say something. Anyone know if he'll have an issue? Don't be surprised if there is some flack. In 99% of schools he will probably be sent home. Sad state but thats the way things are now days. I would send him to school and not worry about it. With all the bad situations in the last year with schools I think i would pass on taking that to school. Might be picking a fight that can just be avoided. I am with you but not sure what you have to gain. Keep it and use it for other stuff, hunting backpack, sleep over, camping, sports, etc. Just my .02. Unless the school has specific rules about not having any gun company names, then I can’t see an issue. I can assure you it wouldn’t be an issue at our local school district....not a small school district either. It’s all about not having a bunch of idiots running the place. Therein lies the problem in many places. I would say "hell yeah you can take it to school, and let those sonsabitches call me if they don't like it! I'll tell them exactly what I think about their opinion....**** commie socialists"...then my wife would put his hunting stuff in it and hang it in the closet and send him to school with the Under Armour one and I'd forget about it until next time we went hunting. What’s the difference in wearing... say a browning tshirt, camo shirt, or something similar. It's been quite a while since I was in school and there have been way more school shootings since then so I wouldn't be surprised if someone said something. I remember a teacher from up North coming down here to teach and she saw a gun I drew in class one day. She told the principal. He never said anything about it to me so it all worked out. Nobody blew anything out of proportion and I didn't go on to kill any of my classmates. But there is and always will be people that take things to the next level and make a big stink over something harmless when they really should just mind their own business. I'd send him on to school and if someone says something so be it. He didn't bring a gun to school or threaten anyone so what are they gonna do? Tell him to get a different backpack maybe. My 10 year old takes a 5.11 12 hour backpack to school with no issues. Ha. This is my thought as well but he lives with my in-laws so I'm not trying to throw anything else on their plate. They aren't really the fight the school district type. I'll probably swap it for one of the other brand packs that look the same just to be safe. The other pack he likes has Velcro so I'll just buy him some patches that convey the same message. Worst case scenario he'll pull them off for the day. doesn't the M and P stand for military and police ? and s&w makes more than just those EVIL guns . seems to me the argument would be an American company supporting our military and police. uuuhhh 1st amendment right ? . I would send him with it and back it all the way . Seeing you are his uncle, what did his parents have to say about the pack? Why not just let him keep the S&W pack and tell him it would be a good one to keep his outdoor stuff in (hunting, fishing, hiking, etc.). Buy him another pack for school. Reward good grades, behavior, and athletic participation by buying him stuff to put in his outdoor pack. I'm a very big 2nd amendment advocate but we really need to be smart these days because the media and liberals have mastered twisting the truth and getting the ignorant to support their misbegotten agenda. Plus and outdoor pack is a good way for his uncle to teach him invaluable skills - how to sharpen a knife, how to shoot a bow, how to properly handle and clean a rifle/pistol/shotgun, how to tie a hook and cast a spinning reel, how to read a topo map, how to start a fire, how to identify trees and birds, etc. An 11 year old needs a good role model and this is an opportunity for you to teach him about being a man. (er, at least a few things I think every man should know). Good job being an uncle who gives and dang. My in-laws raise him. Never met his dad, mom is more like a sister that is sometimes around. When I dropped him off I told them about the first backpack and my MIL got a horrified look on her face. What concerned me the most is if there was a problem, that backpack would get put in a closet and he'd have to wear whatever is around. There wouldn't be an exchange or new one bought unless I heard about it. This is why I love this forum. I can always come here and know that there are a good many of us that still have a lot of common sense. Excellent post sir. Where’s he go to school?! I'm not sure which school he goes to. He is in Conroe ISD, same as my kids. Does the school have anything against it in the dress code? I would bet it will be fine unless another parent has an issue with it. But if there isn't something specific in the dress code of the school there wouldn't be much they could do about it. I wouldn’t. The backpack will immediately go feral and start shooting everyone on its own. Most people wouldn’t know what the M&P stood for anyway. Those that do will likely be cool about it. Would anyone in that school know what Smith & Wesson M&P really stand for with all the snowflakes running schools now days? You’re a good man Charlie Brown. It was hard being 11 some 30 years ago and I’m sure it’s only gotten harder. The world gets more complicated everyday. I didn’t mean to imply you weren’t already being a good role model - sounds like you got that covered. Good luck on that pig hunt.